Stamp seals were used in a similar way to modern signet rings: a negative object used to impress a design into another material, often clay. They are common from around 7000 BC and have remained in use in parts of the world continuously until the present day. This volume focuses on the British Museum’s collection of Middle Eastern Late Neolithic and Early Chalcolithic (~7000–5000 BC) seals used in modern-day Syria, south-east Turkey and northern Iraq. In addition to a catalogue that includes all provenanced examples of these seals in the Museum’s collection, the volume presents a new interpretation of these objects by discussing the role of stamp seals in prehistoric society and considers how they were used and why they were made. 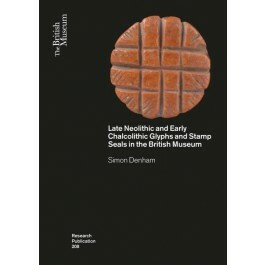 Whereas previous studies have assessed stamp seals as purely administrative objects, this new publication argues that they should be interpreted in their own, Neolithic, context. The result is a completely fresh approach to Middle Eastern prehistoric studies that complements growing archaeological interest in this period.